The Brooklyn Nets & the rest of the NBA are done with their preseason schedule. Jeremy Lin, despite the Nets going just 1-5 in their exhibition games, had an overall very good first run with the Nets, establishing his position as the team’s best player. Yesterday we did a little run down of his numbers and averages through the five games he played in (rested in one of them as the Nets visited the Knicks at the MSG). Today is a run down with highlights, so we can see beyond the numbers of the preseason, and see with our eyes how well he did when on the floor for the Nets, who too many times looked clueless without him. The Nets won their only game of the preseason, beating the Pistons 101-94. Lin needed only 17 minutes to score 21 points while sinking 5 three-pointers, showing that he’s not just the Nets best playmaker, he’s their best scorer and best player overall, which influences the motion offense and everything else for better when he’s on the floor, while things get clunky when he isn’t playing. 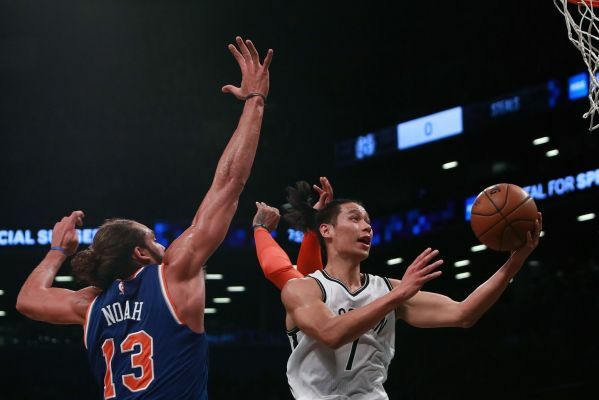 After resting in the second preseason game against the Knicks, Lin led the Nets with 16 points in 24 minutes, once again shooting in very high percentages, also dishing out five assists. The problem for the Nets in this game, losing 121-100 to the Heat, was being unable to stop Miami anytime they got the ball near the rim, a problem that’s been there for most of the preseason. A 100-97 loss for the Nets (their third in a row). They actually looked better defensively compared to their previous two games, but once again, the difference between Lin playing and resting was tremendous. He finished with a +11 in his 27 minutes, despite not knocking down any 3-pointer (0-for-3), finishing with 12 points and 7 assists. Same problem as before, with some very bad minutes for the Nets early on and in the third quarter, which was the moment the Nets went to their bench. Lin finished with 5-for-7 from the field and 5 assists, scoring 13 points in 19 minutes. This started the whole “it’s only preseason, but…” frame of mind a lot of people are in when it comes to the Nets. The preseason finale, which was mostly a good one for Lin. He did turn the ball over 8 times, but half of them weren’t his fault and overall, the Nets require him to do so much it’s bound to have an effect on his efficiency from time to time, even if it’s already been established the more Lin plays the more efficient he actually becomes. Lin had his most productive game of the preseason, with 24 points in 30 minutes, including 10 assists, also getting to the line 13 times.